UTI Equity has delivered 3-year annualised return of 27.08 per cent, compared with the category's 21.56 per cent. The fund has delivered 3-year annualised return of 27.08%, compared with the category's 21.56%. 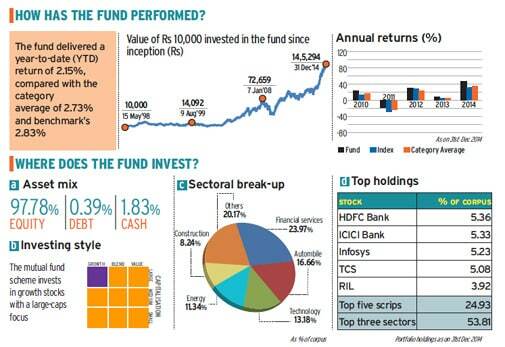 One of the oldest Indian funds, UTI Equity has a 22-year history, but its past 7 years have been the most rewarding. Launched as UTI Mastergain, its initial years were nothing to write home about. From being an index-hugger in its initial years, the fund has matured to take substantial active calls that have paid off well in recent years. Oflate, it has added a mid-cap flavour to the portfolio. The fund has been particularly good in bear markets, containing downside to levels far lower than the index in 2001, 2008 and 2011. As a consistent fund that navigates bear markets really well, the fund is tailor-made for a conservative investor. Anoop Bhaskar is head equity at UTI AMC since April, 2007. Before this he has also worked with Sundaram AMC, Franklin Templeton AMC.